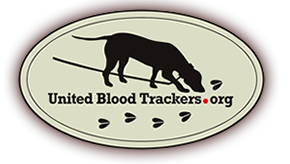 Illinois- Dogs may be used to track wounded deer, so long as the following conditions are met. Any person using a dog for tracking wounded deer must maintain physical control of the dog at all times by means of a maximum 50 foot lead attached to the dog.s collar or harness. Tracking wounded deer is permissible at night, but at no time outside of legal deer hunting hours or seasons shall any person handling or accompanying a dog being used for tracking wounded deer be in possession of a firearm or archery device. Persons tracking wounded deer with a dog during the firearms seasons shall wear blaze orange as required. Dog handlers tracking wounded deer are exempt from hunting license and deer permit requirements so long as they are accompanied by the licensed hunter that wounded the deer. Only certified tracking dogs can be used on department sites. Other restrictions apply.